Organizing projects as spring makes its way, will aid in getting your house in shape while acting preventatively, livening the inside and outside for the new season. Windows/Doors - Clean the windows with glass cleaner, both sides and look at the windows, particularly if the end of the warranty period is being approached searching for failure at the glass seals, frames and all parts. Replace screens that have been cleaned. Inspect door and window seals for air-tightness, to reveal drafts. Furnace/AC/HVAC - clean or replace filters as needed, including for humidifier. Reset thermostat range if needed. Some systems require regular checkups by qualified personnel. Garage - see that automatic openers move right and that sensor lenses are clean, and aligned with connections intact. You might run a wall duster before cleaning the floor which will also keep the house clean. Walls - dust the walls with an extendable duster. Replace home security alarm batteries if it is within a reasonable time. Note any patching/paint work. Flooring - clean and inspect all flooring. View all areas of ingress and egress. Clean and seal tile/grout if needed, which will help keep it that way, and check that carpet transition areas are firmly down near bordering floor types. Basements - look for signs of water leaking and if you find anything, contact a pro. Inspect the sump pump and back-up if there is one, to discharge the water to come. Roof - View the roof areas for shingles that are out of place. Which are possible spots of water infiltration. These are not complicated repairs to make, better than having to fix rain water damage on the ceilings. Gutters/Drainage - there should yet be a slope around the house to drain away water. The downpouts, and grated drain areas should be checked for debris. Look at the gutters and make repairs for sagging that might have been caused by snow loads. Siding/Painting - view the siding and evaluate if there is painting, cleaning or no treatment at all necessary. Noting that there should be no exposed wood. Pressure washing is a quick way to clean down the sides. Try to spot also any rusting metal at the earliest stages, while it is easier to refinish. Caulking - inspect around windows, doors and all areas that may have missing or failure of caulking. Which should be replaced with a quality compound applied. Masonry/Chimneys - look for cracking and separation at the masonry joints. If there are any, re-pointing may be an option. It is important that water should not be entering through any cracks or failures in the joints or bricks themselves. Foundation/Concrete - inspect the foundation and make note of any cracking. This should be addressed by an pro and it might take an evaluation. Walk the concrete drive and walkways for signs of cracking and separation too. Decks - blow or sweep the fallen debris. The floor slat gaps should be clean thus promoting circulation. View for damage to the deck, stairs and rails and if additional cleaning is needed. Awnings - the fabric awnings usually should be professionally laundered. If they had been removed, this might be the time. Outside AC/Compressor Unit - clear off any debris. There should be a free air-flow above and around it. 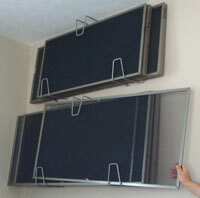 Doors/Windows - replace the storm door glass panels with screens, and place glass panels in storage. Due to the change in weight, adjust the closure mechanisms for more gentle shutting. Landscaping - consider putting down ground cover on new bedding, before spreading out mulch. Limbs, branches and vegetation should be trimmed away from the house. Look to the trees for pieces of stuck branches.